Suddenly experiencing a Torn Biceps Tendon can be painful and debilitating. Biceps tendon tears occurs far too often, in athletes and workers alike, be it construction or office work. There is a reason Bicep tendons tear. There is a clear cut CAUSE. And it's not that activity that was being performed when the Bicep tendon tore. When a Biceps tendon tears, there is a predictable pattern. A pattern of the mechanics of how something tears, and the side effects of that as the body responds. Healing torn Bicep tendons can happen in only 3 ways, and it very much depends on how big the tear in the tendon is. Partial tear is very different from complete Biceps tendon tear. So, let's get you up to speed on WHY torn Bicep tendons occur, what exactly happens in the process, and what your options are to make it all better. A Torn Biceps Tendon happens for ONLY one reason: There is an electrical disruption in the musclular system, and the muscles aren't optimally doing their job. A muscle's job is to absorb force. Like a shock absorber. Put five fat guys in a car and there is no bounce left. And all that force has to go SOMEWHERE. In your case, it transferred to your Bicep tendon, which became a torn Bicep tendon. Tears in tendons happen when more force is delivered to a tendon than it can structurally handle. And tendons are STRONG! They're just not designed to handle so much load directly. That what muscles are for. So over time, you've developed compensation pattern. The body tried to adapt, etc. Maybe you developed Bicep pain, maybe you developed Bicep Tendonitis. Both are functions of pain and compensation from muscles not firing optimally. Your Tendon Was Not Weak! Your Bicep tendon was NOT weak. Sure, maybe you had some Tendonosis with your Tendonitis, but hey, who doesn't? Doctors and PT's and probably even you focus on your tendon, and put the blame on the tendon. The tendon is a factor, certainly, but personally I prefer to deal with the CAUSE of the problem, the CAUSE of the Bicep tear. Dealing with the tear without dealing with the reason that it tore in the first place...well....that why so many workers and athletes experience injury over and over. You can get a torn Biceps tendon at the top attachments up at the shoulder, or down towards the elbow. We'll use a simple example of doing bicep curls with weight. You grab a weight and start doing curls. The muscles aren't firing optimally. They're not firing hard enough, fast enough, and possibly parts of them aren't firing at all. The nervous system tries to adapt and compensate, firing other muscles to help out. You're still doing curls, and all the force the muscles aren't absorbing is hitting your bicep tendon and attachments. The weakest parts of a tendon are where it connects to the connective tissue that wraps around bone, and where tendon blends into muscle. The spot taking the most load that it's not capable of handling it gives way. Partial or complete tear results. This is a torn Biceps tendon. Pain. Inability to lift weight. Process of Inflammation and Pain Causing Dynamic that were -already- there flare up. Depending on size of tear, doctor says Rest or Bicep tendon surgery. Both options result in a Tendonitis dynamic. You don't have a lot of options here. 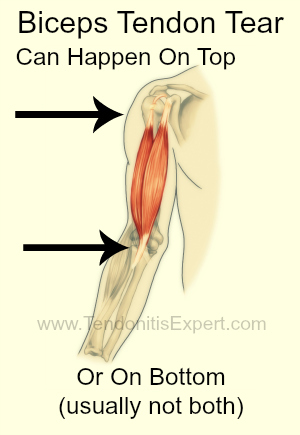 a torn Biceps tendon is a far more significant issue that regular Tendonitis. The bigger the tear, the fewer your options. You have a lot of options in this scenario. Only a few of them will really help though. This is common Tendonitis. Tiny tiny little tears that cover up with scar tissue fibers, that rip and get covered with scar tissue fibers, repeat. In this scenario, the microscopic wear and tear really isn't the problem, it's just a symptom of a bigger problem. The factors that cause the tendonitis dynamic are the cause of microscopic wear and tear on a tendon. Fix those factors, and the tendon pretty much takes care of itself. Rest and Anti-inflammatory drugs like Ibuprofen are doomed to fail. You just can't beat the Reversing Bicep Tendonitis ebook protocol. Say, 2%-15ish %. This -might- heal up fine on it's own, but it's unlikely. Because the forces and factors that caused the tendon to tear in the first place are still at play. Muscle and connective tissue is still TOO TIGHT, and muscles not firing optimally. Chances are high that this will hurt for long periods of time, and continue to rip a bit by bit. PT, acupuncture, rest, splinting, etc, may do it for you, but I wouldn't put money on it. 'Reversing Biceps Tendonitis' will help greatly, and likely will allow you to heal yourself fully. It will take time and diligence, but it's doable. Surgery is an option, but again, biceps surgery doesn't reverse any of the factors that caused the problem in the first place. You only have two options here if you want to get functional again. Bicep tendon reattachment surgery, and The ARPwave System. Surgery cuts in and reattaches the tendon, cutting away any shreds. Then you get casted and immobilized to give the tendon a chance to grow back together. Then they take the cast off and all your connective tissue shrunk wrapped down...now you have to work to lengthen your arm again. Remember, all surgery does is reconnect the tendon. It doesn't fix the CAUSE of the tear. Still, reattached tendons are pretty good. Your other option is The ARPwave System. You can most likely avoid surgery this way, and expect a 6-8 week FULL recovery. Interestingly enough, if you effectively fix the CAUSE of the tear, the tendon will heal. Even big tears. Take out the muscle tightness, fix the electrical disconnect, and the body heals surprisingly fast, from injuries that you wouldn't believe could be helped without surgery. You'll be VERY impressed with what The ARPwave System can do. If you've had a complete Bicep Tendon Rupture, again, you only have two options. See the above section for details. Same details apply here. The ARPwave System may be able to have you avoid surgery and help the tendon reattach itself. You'll have to talk to the ARPwave guys about that, as it depends on the specifics of the torn Biceps tendon. Even if you get surgery, if you want a FULL recovery in 6-8 weeks, the ARPwave System is the way to go. Otherwise you're looking at a 6-12 month recovery, which may or may not be a FULL recovery (unlikely). Return to the top of this Torn Biceps Tendon page.